Enjoy an afternoon with friends while watching a new release movie. Please see the September Newsletter for the movie. Cost includes popcorn. Tickets must be purchased before March 30th. Take charge of your Diabetes and attend this informative workshop which will teach how to enjoy an active life, keep your feet healthy and prevent foot complications through good diabetic foot care practices. Save the date! Are you a LAF volunteer? 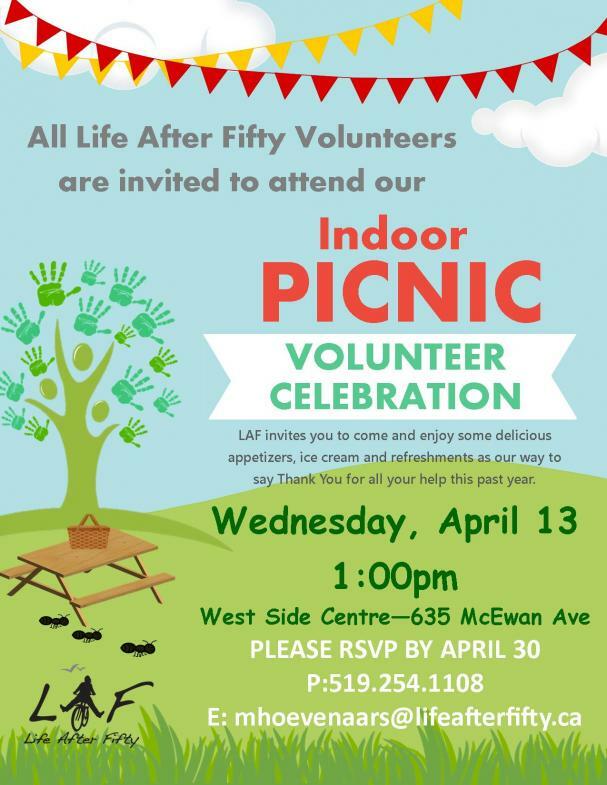 Life After Fifty staff invites you to celebrate with us on April 13th at 1:00pm as we express our appreciation for your volunteer service over the past year. All volunteers who have volunteered over the past year for any of our events/programs are welcome to attend. Please call 519-254-1108 or stop by reception if you plan on attending, by March 30th.